– a 3rd Quarter Pipe got installed, so now the track consists of 2 regular ramps, 1 Superkicker and 3 Quarterpipes. Never before have been so many Quarterpipes included in a FMX competition course! – Mat Rebeaud (SUI), Harry Bink (AUS) and Brody Wilson (USA) met the „Dance of the Flyers“ for our Teaser Jump and created some amazing photos, that you can also find in the Red Bull X-Fighters Newsroom or http://www.redbullxfighters.com/en_INT/article/high-flying-action-mexico. Our 12 athletes all look ready to rock at tonights qualification, here a quick first impression after yesterdays track testing session and todays morning practice sessions. You will find pictures in the Red Bull X-Fighters Newsroom. Levi Sherwood: The 2012 Red Bull X-Fighters World Tour champion has surprised everyone with a very big new trick off the quarter pipe. He has succesfully landed it in the track test session and we expect him to land it for the first time in competition at tonights qualification. So expect FMX history to be re-written tonight and in tomorrows main competition. Tom Pagès: The 2013 Red Bull X-Fighters World Tour champion is set to continue the progression of FMX as he launched his newest trick, the Alley Oop Flair in a video leading up to the season kick-off here in Mexico. But he does not only have a new trick in his pocket, he also shipped his revolutionary FMX bike to Mexico. The bike is a Yamaha YZ 250, but he modified it extremely to save about 15 kg in weight compared to the stock machine, that is another revolution out of camp Pagès. Also check http://www.redbullxfighters.com/en_INT/article/lightest-freestyle-bike-ever for more about Toms stunning bike! Dany Torres: The 2011 Red Bull X-Fighters World Tour champion has switched back to the lighter 250 ccm two-stroke machine and is feeling well on his KTM 250 SX. He got metal removed out of his body during winter time and is in good shape. 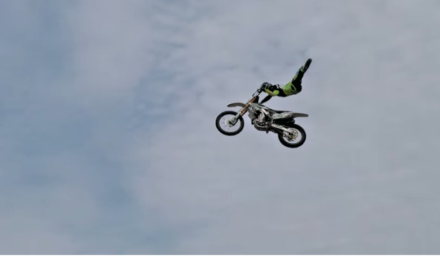 Mat Rebeaud: The 2008 Red Bull X-Fighters World Tour champion has proved that you can teach an old dog new tricks and he succesfully landed his first California Roll to dirt during yesterdays track test session. Don’t count the former Mexico winner out! Clinton Moore: The australian has shown a high riding level last year, but struggled to transform it to podium results. But he knows he as able to crack the top three and has the tricks to get that mission completed. Remi Bizouard: The frenchman had a good season start in Europe, leading the european championships and is ready to continue with his good run. After his first ever Red Bull X-Fighters podium last year in Japan, he is hungry for more. Adam Jones: the technical rider from USA got his shoulder fixed during wintertime and had good practice sessions leading up to the Red Bull X-Fighters kick-off. Javier Villegas: Javier is healed up after his bad luck of inuries of last season and wants to get back to where he has been before. Brody Wilson: the US-native wins the hearts of the fans with his big extensions and a lot of style. Being known for his freeriding skills Brody is determined to show that he also has the tricks to convince the judges in the tight bullfighting ring. Jeremy Rouanet: The practice partner of Tom Pagès has shown great progress in the past seasons and also has big quarterpipe tricks in his sleeve, a must-have for the podium nowadays. He might surprise! Harry Bink: the young australian fella is celebrating his Red Bull X-Fighters premiere in Mexico and experiencing the problems that international travel can cause since some of his bike parts got lost on the flight. But the 20 year old is determined to make his name stick in the FMX fans minds. Erick Ruiz: the young mexican local rider stuck the first latin american „Volt“ during last years event and for this year he is planning to show another body varial during the competition. So the competitions is looking to be tight and innovative and tonights qualification will likely show some trick premiers. You can follow the live results at redbullxfighters.com. You are not amongst the 38,000 screaming fans in the Monumental Plaza de Toros in Mexico City on March 6th? Catch the live broadcast of the spectacular Red Bull X-Fighters season opener on Red Bull TV and redbullxfighters.com. And here is a special treat for our hard-core FMX fans: See all the runs from 1st round exclusive on redbullxfighters.com at 9:00 pm CST.